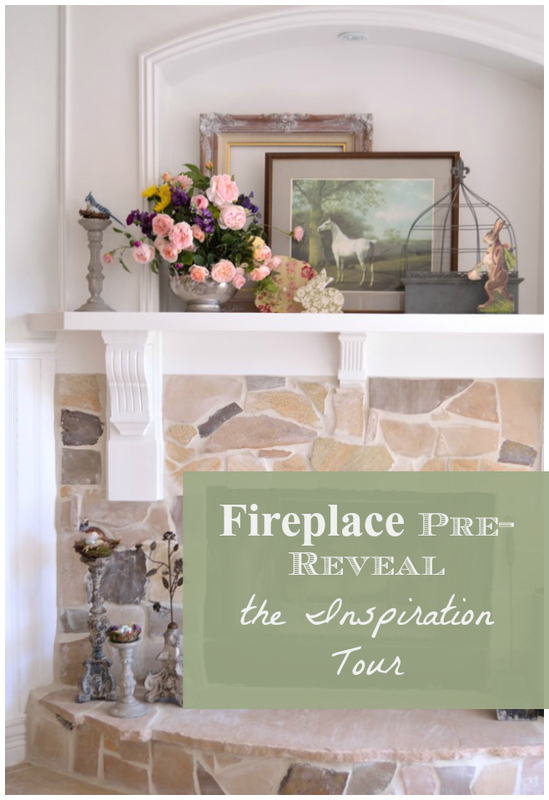 In preparation for the reveal of our fireplace project in our family room, I wanted to share fireplace ideas and inspirations that influenced how we designed and executed our fireplace renovation (hopefully to be shared in a post next week). 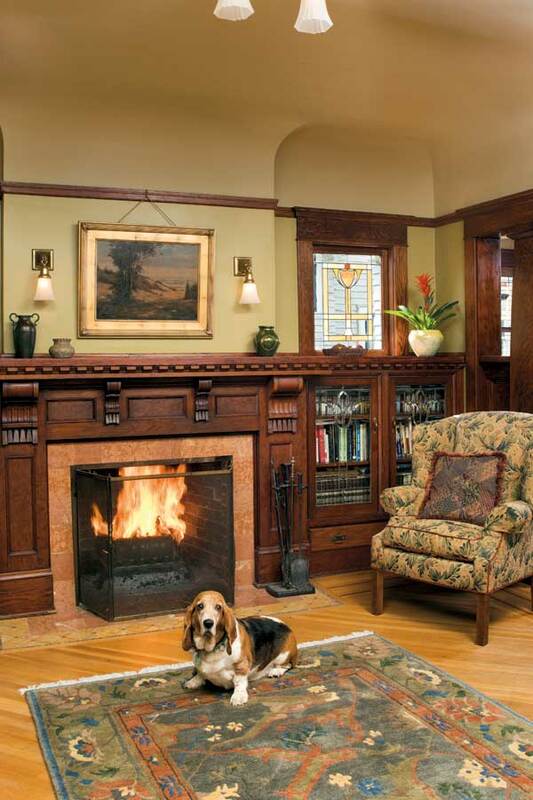 I've included the source links to the original website location for each image for those that are interested in taking a tour of beautiful, breathtaking fireplaces, not to mention the interesting history of fireplace styles and design. I never get tired of looking at the over-the-top, elaborate fireplaces found in the European palaces and estates as well as historical American homes. These things were grand, architectural statements that not only reflected the design aesthetics of the period, whether it be Baroque, Rococo, Federal, Georgian, Art Deco, or any number of other styles, but were also intended as a symbol of the home owner's wealth and place in society. While our updated fireplace is no where near as grand and elaborate as the fireplaces in the next few photos, I'm showing them because (a) they are gorgeous works of art and (b) many of the features and details and overall proportions are still used in the design of modern-day fireplaces, albeit in a much simpler and more informal manner. The detail and ornamentation in this Victorian fireplace is amazing. 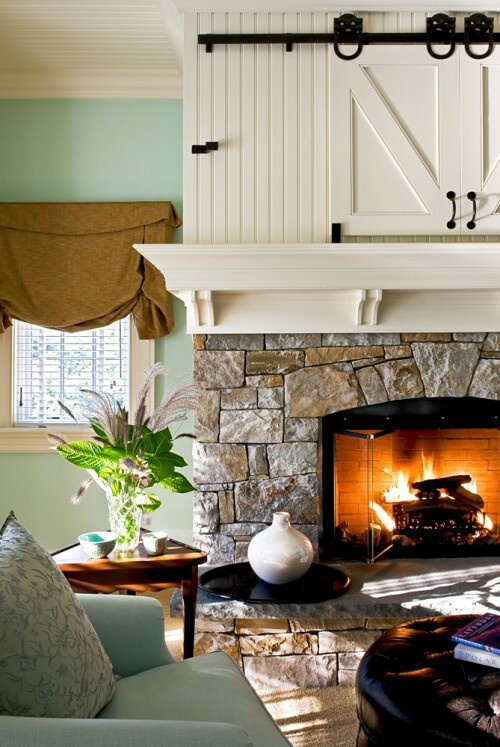 The form and proportions of Federal fireplace mantels and surrounds have become the standard starting point for the design of many traditional fireplaces today. 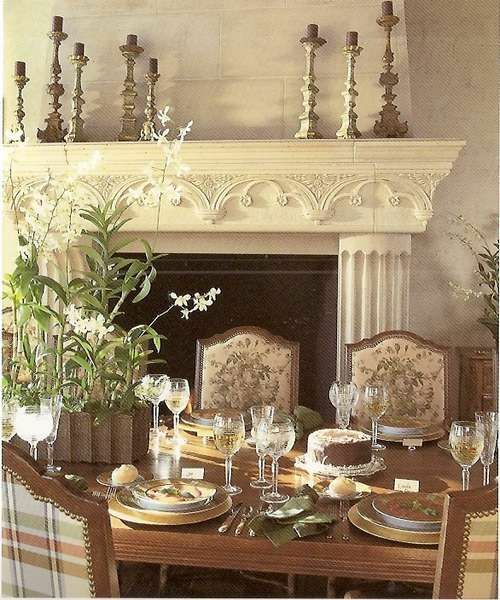 I find that I prefer Georgian and Federal fireplaces that use a lighter touch when it comes to the way classical forms and design motifs were handled-- including woodwork that was painted white or some other light color. Most fireplaces in humbler early American homes were simple and utilitarian. 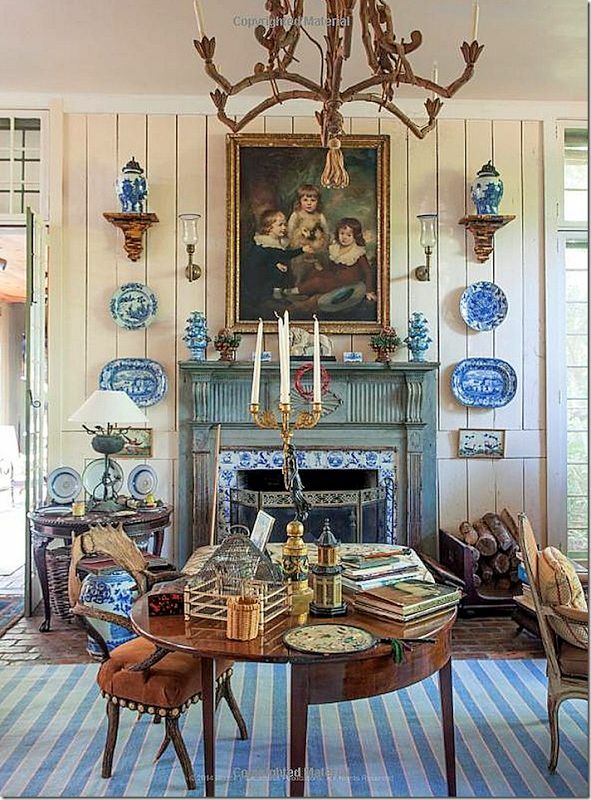 Like their European counterparts, the fireplaces in the homes of wealthy early American landowners were more elaborate statement pieces. I couldn't verify it in a quick Internet search, but the man in the photo painting below certainly looks to me like George Washington. If it is him, this view of him sitting in an attitude of repose and reflection in front of his fireplace is a nice change from the usual depiction of the Father of Our Country-- where he is typically shown stalwartly crossing the Potomac or standing masterfully besides his eagerly pawing warhorse, resolutely looking off into the distance. 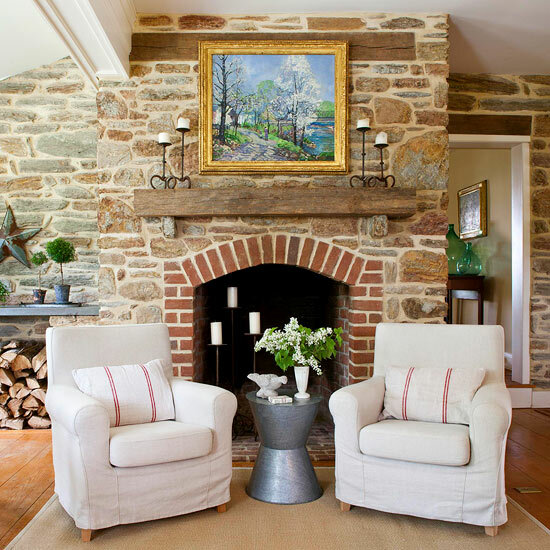 French Country, English Country, and eclectic-whatever-catches-my eye, I rounded up a couple of photos of fireplaces that fit into this theme and that I found especially appealing. 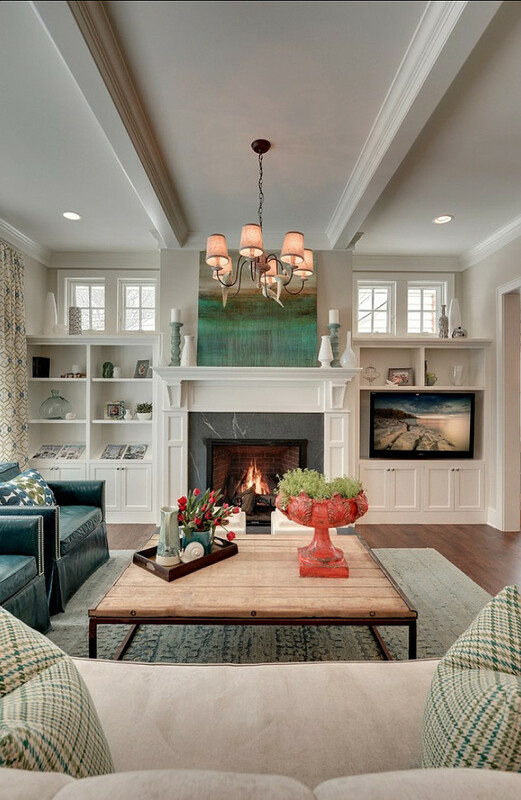 However, as lovely as the fireplaces in the previous photos are, these styles are too grand and formal (and in a few cases, too feminine) for our family room. 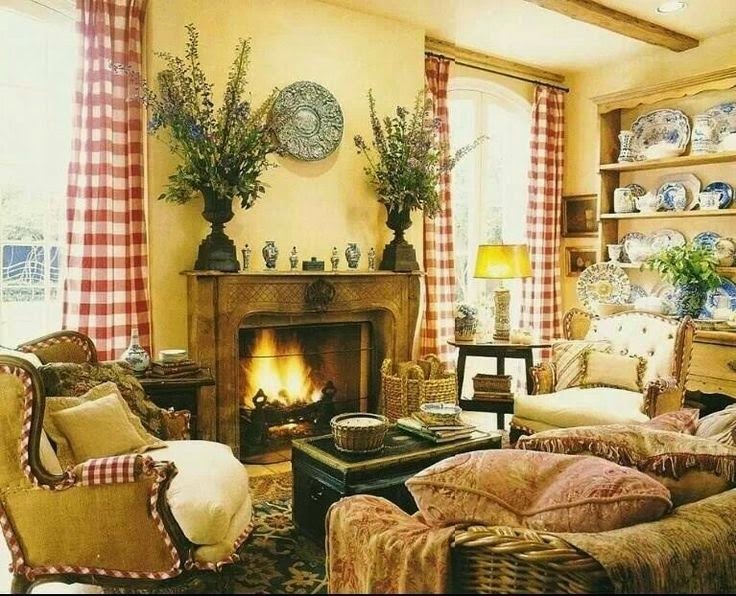 In deference to my husband, I have done my best to restrain myself and avoid an overload of more feminine French Country elements in our family room. 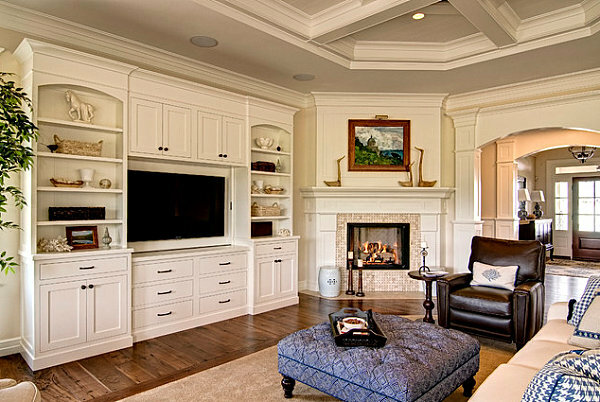 Arts and Crafts fireplaces are more in keeping with the casual, informal look of our home and the style of our family room. This is a style that is simpler, and often more masculine in its details, but with enough pretty, elegant details to satisfy me and work well with the molding and wainscoting we have added to the rest of our house. 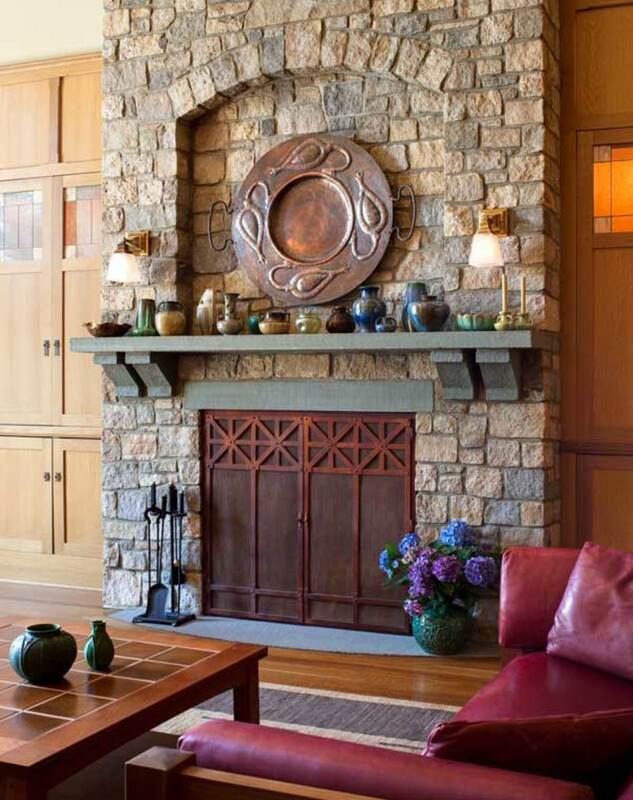 Using stone was another consideration in the design of our updated fireplace. My husband has long wanted to try his hand at stone masonry, especially in the context of renovating our fireplace. Not a problem with me, since I have long wanted to try my hand at combining the rough, rustic elements of stone with the finer, more refined look of painted woodwork, which was, after all, necessary, since, as I note above, we had already installed a lot of painted white molding and millwork throughout our house. The next few photos are great examples of how this combination of the fine with the rough has been successfully accomplished. 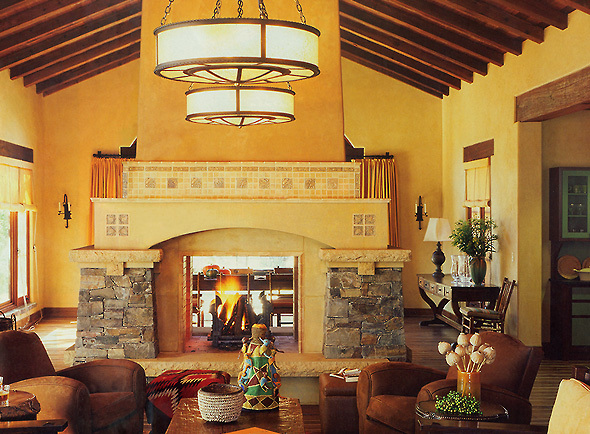 This fireplace shown below was the inspiration for the type of stone we chose as well as the application method. After completing our staircase-renovation project, I have had wall niches on my mind quite a lot because I love the way the little bookcase/wall niche turned out on the stairs (click here to see how that project turned out). Wall niches add an extra dimension and depth to the architectural details and elements of a home, and of course, provide additional display area (I'm always in favor of that). Our fireplace-update project was my chance to do it again. Since our fireplace is located in a corner, I was interested in examples of how other people handled this type of placement. 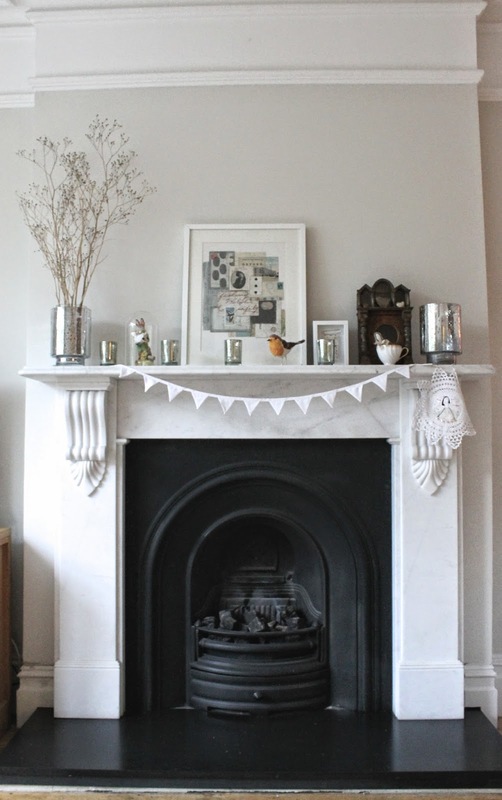 I also liked the idea of a simple 'shelf' mantle as opposed to a chunkier mantle made up of layers of moulding pieces ('shelf' mantles are also another common design element seen in Arts and Crafts fireplaces). 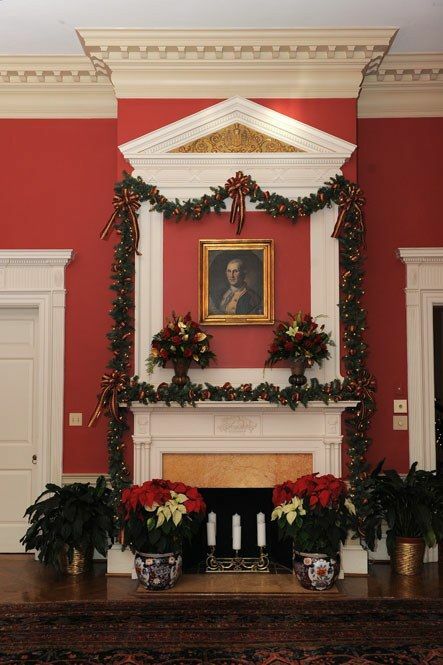 There is no shortage of examples of how people decorate their mantles and I've only included a very few here. 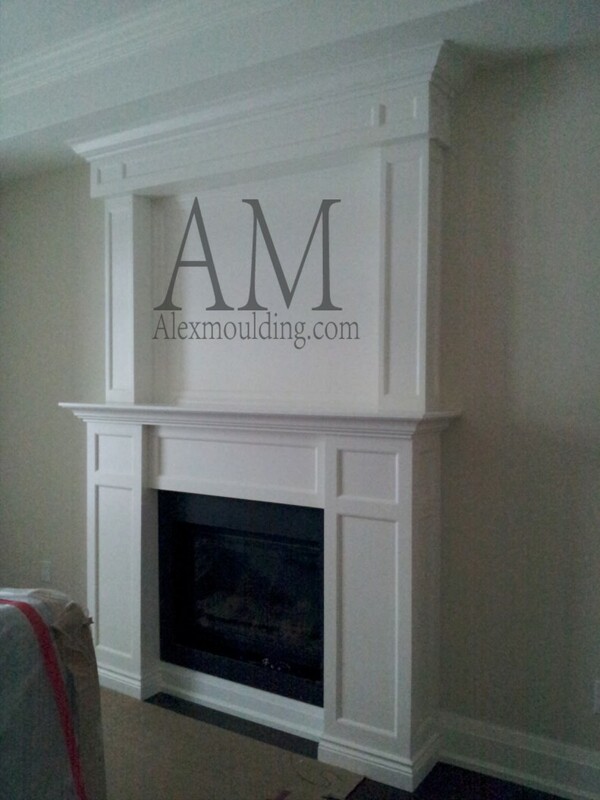 Thanks for visiting and stay tuned for our fireplace reveal! I enjoyed getting to see all of those beautiful fireplaces! Can't wait to see yours. 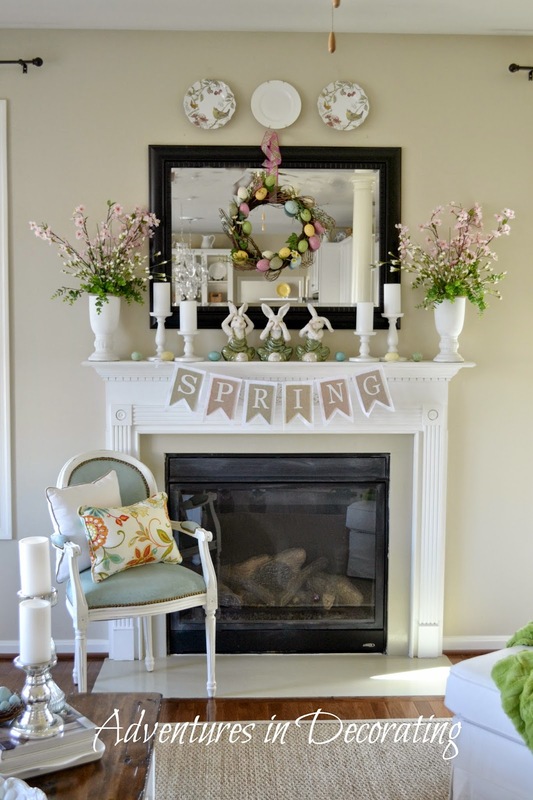 Looking forward to seeing your fireplace! Love the variety of the ones in your post! Love all your inspiration pieces. 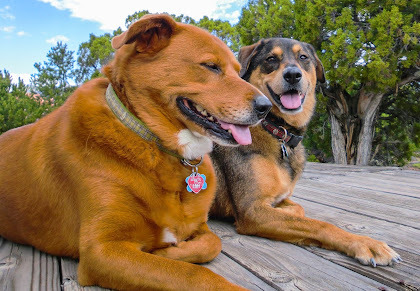 Can't wait to see yours!